The Chicco NextFit Zip Convertible Car Seat has 9 recline positions, which is more than any of the convertible car seats that I've reviewed. The RideRight bubble levels indicate the correct seat angle in both the rear and forward-facing modes. The SuperCinch Latch Tightener helps you get a tight and secure fit without using too much muscle power. The seat pad unzips from the shell and can be machine washed. The ComfortFlex harness management has a padded, flex-out design that is designed to keep both sides of the harness waist belt up and out of the way for easy in and out access. This car seat is designed for use with children from 5 to 40 pounds for the rear-facing mode and then 22 to 65 pounds for the forward facing mode. As of this writing, The Chicco NextFit Zip Convertible Car Seat had 35 reviews and 27 answered questions. I've read the reviews and the questions and then condensed and summarized the results into the hot topics left by parents. So let's dive right in and see what the parents had to say. The Chicco NextFit Zip Convertible Car Seat has passed all of the safety standards as required by law. This is a convertible car seat, so it's not going to be as portable as an infant car seat. That means that you won't be able to fit it in a grocery shopping cart or carry this around with a handle while your child is on board. Unfortunately, one of the drawbacks to convertible car seats are that they are not as portable as the infant seats. If you do have to carry this car seat, it might be helpful for you to know that it weighs 25 pounds. The nice thing about this car seat is that the seat pad can be removed and machine washed. This seems to be a standard feature on car seats. It's also a nice feature because car seats can get dirty very quickly. A common complaint was that the straps did not also come off for easy cleaning. One parent had this to say. "The straps are not "fully" removable for cleaning purposes." While another had a similar complaint about the straps, "I had to power spray and clean the belts with the hose and some Lysol. To me, that's not clean like a washing machine. I've had four children and this is the first seat that doesn't let the belts come out to wash. I don't think I would have bought it had I known this aspect of cleaning. The zip out fabric cover is great, but you still have to take the whole seat out and spray down because if the fabric is dirty, so are the belts." This car seat is easy to install. Parents were overwhelmingly positive on the topic of installation. Some car seats are very hard to put in and require some serious strength and determination. This is not the case for the Chicco NextFit Zip Convertible Car Seat. I will quote a few parents here who have installed this car seat. One said, "So incredibly easy to install." Another commented this, "It was unbelievably easy to install rear facing!" And one more, "BEST. CARSEAT. EVER. It’s simple to install, and when installed right, it doesn’t move AN INCH." The Chicco NextFit Zip Convertible Car Seat did not have a whole lot of reviews left about comfort. But those that did respond on this topic were all positive. One parent said this, "It’s very comfortable for my son and it can be used all the way from newborn (with the included insert) to 65lbs. I loved it so much, I bought one for each car." The price tag on this car seat is on the high end. Keep in mind that you will get to use it for two stages of your child's growth progression. It is designed to be used for children from 5-40 lbs in rear-facing mode, and from 22-65 lbs in forward-facing mode. Also, keep in mind that many other convertible car seats go from infancy to the booster seat age. Some convertible car seats that I've reviewed will hold up to 100 and even 120 pounds as a booster seat. "This car seat may be a little more expensive than the rest, but it is sturdy and worth the money. It is the top rated convertible car seat on Consumer Reports and that's why I chose it. It has quality memory foam padding. The cover zips off for easy laundering. When you're planning on using a car seat for the entire 6 yrs its worth $50/yr to have your child safe." 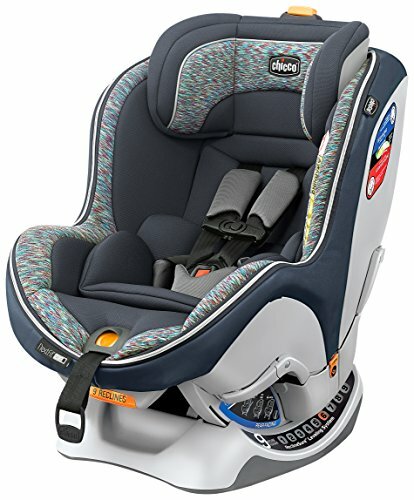 If you are looking for a safe, sturdy, and easy to install car seat that will work for your child up to 65 pounds then this may be a good choice. It is priced on the high side, so be aware of that. However, people who purchased it said that it was worth the extra money. Keep in mind that this car seat will not convert to a booster seat when your child reaches that stage. Some parents did not like that the straps did not come out for cleaning purposes like other car seats. I hope my review of the Chicco NextFit Zip Convertible Car Seat helps you as you look to purchase a car seat for your little one. For more information, check out our Top Ten Baby Car Seats Of 2018.